↑ "Archived copy". Archived from the original on 14 July 2007. Retrieved 2009-06-24. ↑ "FIFA President: FIFA to help the Galloping Major". FIFA. 12 October 2005. Archived from the original on 1 January 2008. Retrieved 2006-11-17. ↑ Mackay, Duncan (13 October 2005). "Lineker tees up another nice little earner". London: Guardian Unlimited. Retrieved 2006-11-17. 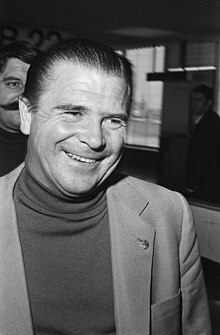 ↑ "Obituary:Ferenc Puskas". The Scotsman. 20 November 2003. Archived from the original on 16 October 2007. ↑ "SOS Children mourns Ferenc Puskas". www.soschildrensvillages.org.uk. SOS Children's Villages. 17 November 2006. Retrieved 20 November 2006. ↑ "Golden Players take centre stage". UEFA. 29 November 2003. Archived from the original on 17 March 2005. ↑ "Hungary legend Puskas dies at 79". BBC. 17 November 2006. ↑ "Puskas 'taken to intensive care'". BBC. 13 September 2006.